Director/ writer/ producer Peter Jackson (The Lord of the Rings trilogy, The Lovely Bones) has little to prove to audiences as a filmmaker at this stage in his career after directing two Middle Earth trilogies based on the works of famed author J.R.R. Tolkien. With his most recent foray into Tolkien-ian territory, Jackson’s prequel trilogy expertly implemented the 3D trend catching on among cinematic blockbusters, but with a twist: the frame rate for display/ projection doubled in speed to 48 frames per second (fps). Unfortunately, Jackson’s final chapter is the weakest entry in his The Hobbit trilogy. At 144 minutes, The Hobbit: The Battle of the Five Armies is Jackson’s quickest adventure in the fantasy realm created by Tolkien and could have ended much sooner. It has the most blockbuster vibe out of any of Jackson’s pictures (even the King Kong remake) and borrows from Michael Bay with his drawn-out, extended action/ farewell sequences that slow the pace and flat, unnecessary attempts at injecting humor. The film, however, maintains all the same aspects that make the price for a trip to Jackson’s cinematic fantasy realm worth every cent: heroic leads, Howard Shore’s resilient score, deadly beasts, seamless special effects, and the always charming Ian McKellen as Gandalf the Grey. However, one damning angle will divide viewers’ opinion of the film—the eagles again make a convenient intervention on behalf of the good guys. If one can get past this (some may even welcome it), then the rest of the film should satisfy the viewer who may ask him- or herself, “Is it even a deus ex machina at this point if they’ve pulled this stunt before?” Just like Star Wars, the original trilogy can’t be topped. Many characters (new and old) have contributed to The Hobbit trilogy, but the two leads in Martin Freeman (The World’s End, “Sherlock”) and Richard Armitage (Into the Storm, Captain America: The First Avenger) provide the best performances. Armitage brings a Shakespearean air to Thorin Oakenshield, the King under the Mountain, giving the dwarf lord more than dose of Macbeth’s paranoia and King Lear’s madness. Martin Freeman turns in his top performance as Thorin’s “master burglar,” the titular hobbit of “The Hobbit,” Bilbo Baggins. Freeman’s humble, selfless Bilbo has a similar set of priorities to those of his friend, Thorin, but in an altogether different order. One puts home first while the other loses sight of what’s truly important. Both characters fixate on the Arkenstone with different intentions. Of the returning cast extending to The Lord of the Rings trilogy, little is to be mentioned. The original Bilbo, talented actor Ian Holm (The Aviator, Alien), appears for his brief bookend scene that creatively ties The Hobbit trilogy to The Lord of the Rings trilogy. Orlando Bloom (Pirates of the Caribbean: The Curse of the Black Pearl, Zulu) returns with his bow to heroically fight alongside the good guys of Middle Earth and control the orc infestation as Legolas. Sir Ian McKellen (the X-Men franchise, The Da Vinci Code) once again comes through with another inspirational performance as Gandalf. Early in the film, Galadriel (Cate Blanchett- The Monuments Men, Blue Jasmine), Elrond (Hugo Weaving- Captain America: The First Avenger, V for Vendetta), and Saruman (Sir Christopher Lee fresh off his Christmas metal single) team up for an epic all-star battle of powerful, magical beings at Dol Guldur against the Nazgul and the Necromancer that makes for one of the most memorable fight sequences of both trilogies. Gandalf’s wizard ally, Radagast the Brown (Sylvester McCoy- The Christmas Candle, “Doctor Who”), makes a late appearance in that fight and he’s the only character not in the original trilogy who gets involved. Luke Evans (Dracula Untold, Fast and Furious 6) gives the standout performance among the newer cast members as the audacious, physical Bard the Bowman of Laketown. Evans’ Bard remains crucial to the plot from beginning to end. The Battle of the Five Armies begins with continuing the cliffhanger from The Desolation of Smaug with the dragon Smaug bursting out of Erebor. Evans books the best scenes of the movies as the opening sequence with Bard and Smaug fighting over Laketown will surely come away as the film’s highlight. While all of the citizens of Lake Town take shelter or evacuate (like Stephen Fry’s cowardly Master of Laketown), Bard rushes and climbs towards the dragon in order to defeat it and bring honor back to his family. Evans remains integral to the plot in leading the men and women of Laketown in the titular battle against the orcs, goblins, wargs, and bats. Evangeline Lilly (“Lost,” Real Steel) finishes the trilogy, as well, coming back to play Tauriel—an original character to the films not included in Tolkien’s work. 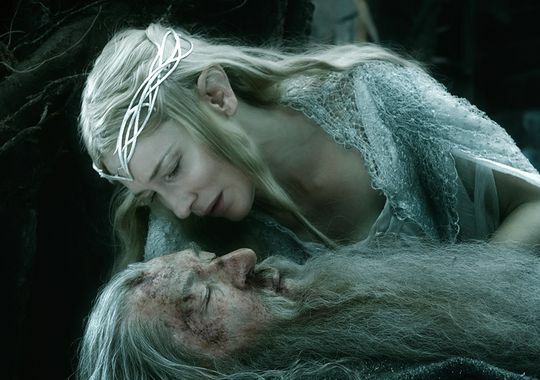 Her elf character still holds a forbidden love with one of the dwarves in Thorin’s company, while also dealing swift, sharp death for the orc horde. Although Tolkien didn’t create Tauriel, Lilly’s performance keeps the same spirit of another female elf warrior from The Lord of the Rings trilogy—Liv Tyler’s Arwen. Of the two characters created for Jackson’s prequel trilogy, Tauriel is the superior. Lee Pace (Guardians of the Galaxy, Lincoln) also returns as the stoic, harsh King Thranduil, leading his army of elves to besiege Erebor in order to gather the jewels in the mountain belonging to him. Thranduil, as he did in The Desolation of Smaug, plays to his own motivations and considers little else beside his son, Legolas. 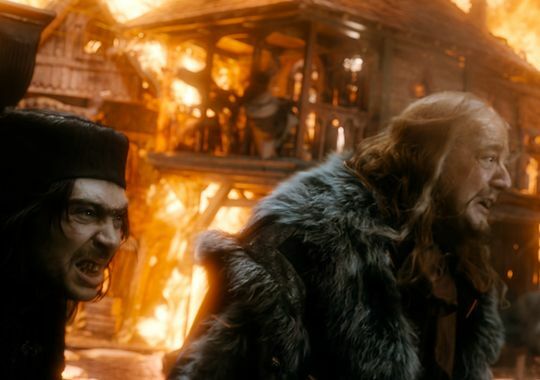 Of all the returning characters, none are more unwelcome in The Battle of the Five Armies than that of Ryan Gage’s (“The Musketeers,” “Murder on the Homefront”) Alfrid, the Master of Laketown’s deputy. He pops in every five-to-ten minutes until the climax and never serves a purpose beyond slowing the pace. This character was also original to the trilogy and not at all like one ever intended by Tolkien. Obviously, the character’s selfish, backfiring antics are intended as the picture’s humor/ comic relief. These jokes fall flat largely to the point where his final antic gets borderline crude for the family audience. Putting breasts made out of gold coins on a character in drag as he carries on a discussion with the no-nonsense, heroic Bard sends a mixed message. The dialogue isn’t heeded, or at best, remembered. All one recalls is cringing at Alfrid wearing a dress that has a bustline overflowing with gold as Luke Evans tries to make sense of the scene he in which he’s acting. Peter Jackson should have cut Alfrid’s scenes from the theatrical release instead of Beorn’s. The two seconds of Beorn gobbling orcs in the Battle of the Five Armies is the sequence’s highlight. Alfrid comes off as an attempted humorous twist of Grima Wormtongue from The Lord of the Rings trilogy, and even talented stage actor Gage can’t replace character actor/ horror icon Brad Dourif. Although the Battle of the Five Armies is but one chapter in The Hobbit, it becomes a 45-minute sequence in the trilogy’s conclusion with several big-budgeted embellishments that will immediately stick out to any Tolkien fan. These embellishments extend beyond the battle sequences; however, they improve the overall quality of the film beside the obvious flaw in Alfrid. Martin Freeman and Richard Armitage valiantly lead a fast-paced, sweeping action-fantasy narrative that bears a fitting conclusion to one of Hollywood’s most memorable franchises. Peter Jackson’s experiment with the combination of 3D and 48 frames per second may not have caught on with other filmmakers, but one must admit his ambition translated well to the silver screen. The filmmaker now moves on to completing his Tintin trilogy with fellow auteur Steven Spielberg.